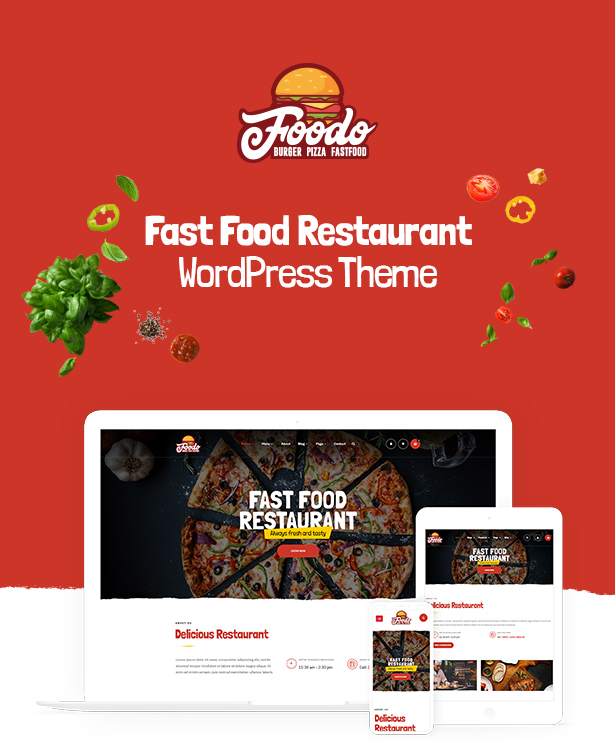 Welcome to Foodo, an exquisite restaurant WordPress theme that is sure to satisfy everyone’s taste buds! 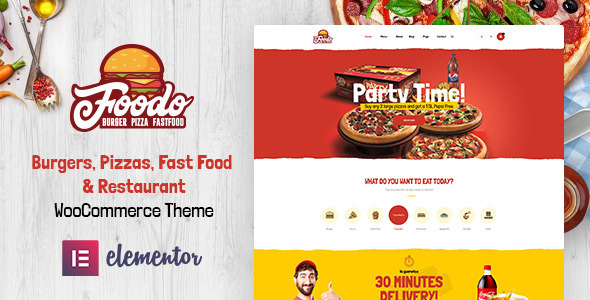 If you are looking to develop your restaurant business, Foodo a perfect design with the harmonic mixture between colors and layout space so ideal for you to sell pizza, cakes, bakery, drink, food, fast food, pasta or cheeseburger restaurant, pizza parlors, seafood, fast food, Asian food, burger restaurants, and many more. With its remarkable home and inner pages, you can effortlessly build a mouth-watering website! 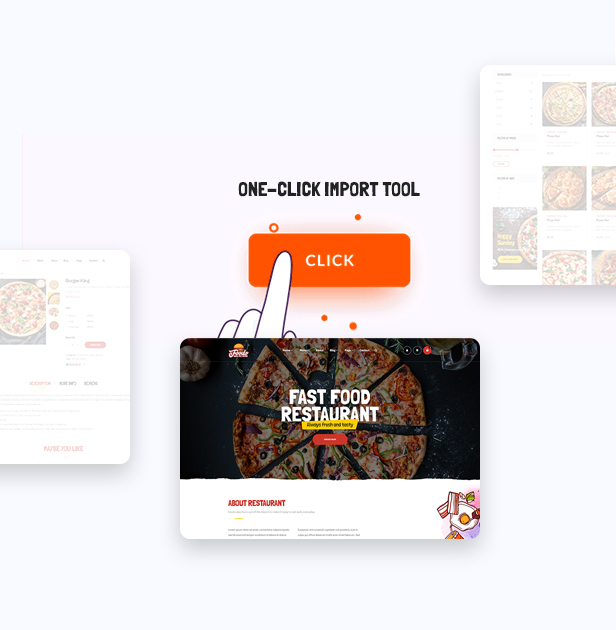 The theme is well built with 04+ homepage demos and inner detailed pages with good looking appearance, eye-catching layouts, amazing styles & multiple shop layouts. 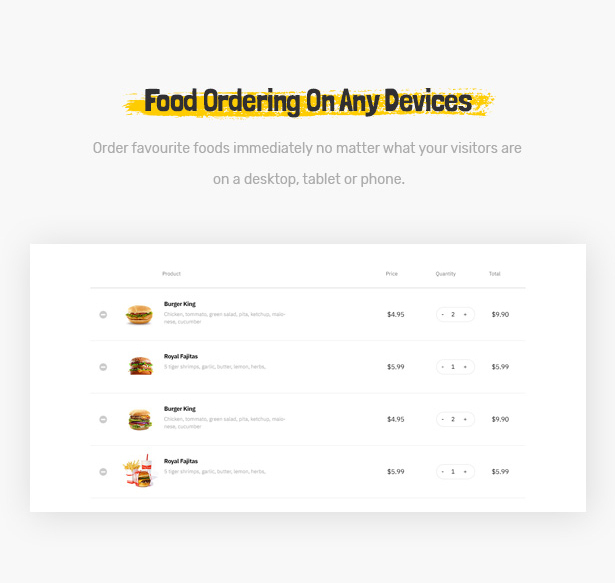 Apart from being responsive, Foodo is well structured and clean code ensures a smooth user experience for all visitors. What’s more! It uses the fastest page builder – Elementor helping you to create an impressive homepage by drag & drop elements. Compatible with One-click installation allows you to build any demo with just 1 click so quickly. And so much more other incredible functions that we can’t ignore. 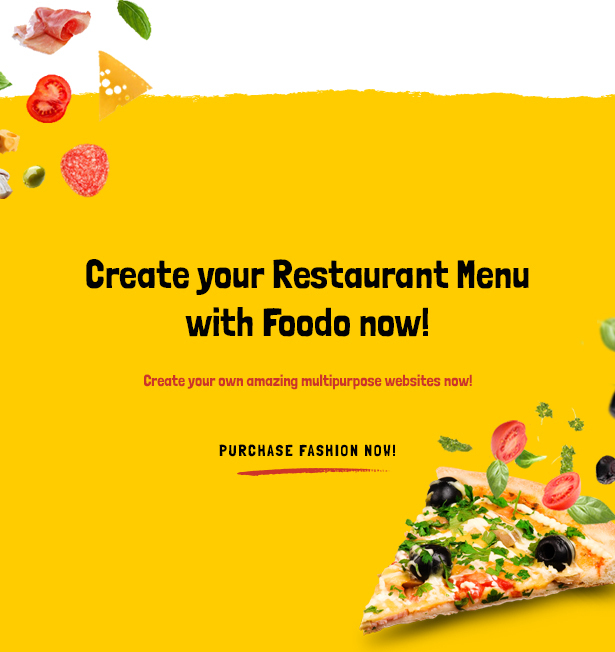 Just imagine how your wonderful your brand’s website when using Foodo – an excellent choice for your online food store business! 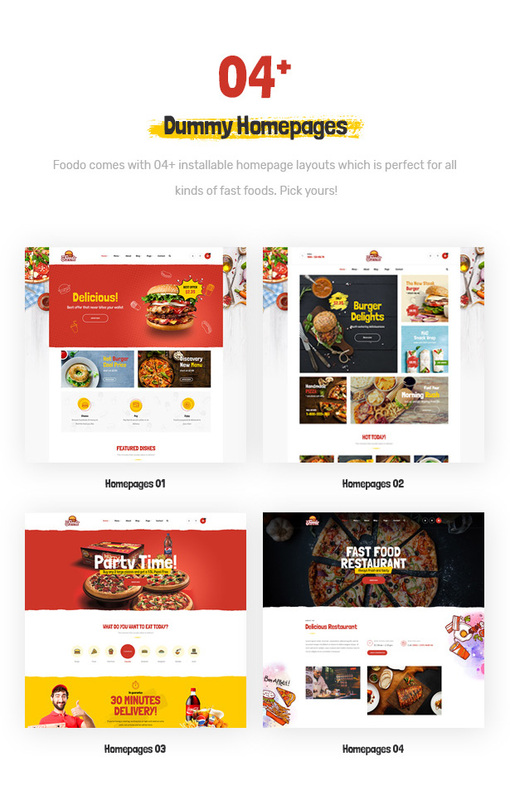 Foodo will expand your selection with 04+ yummy homepages layouts available. 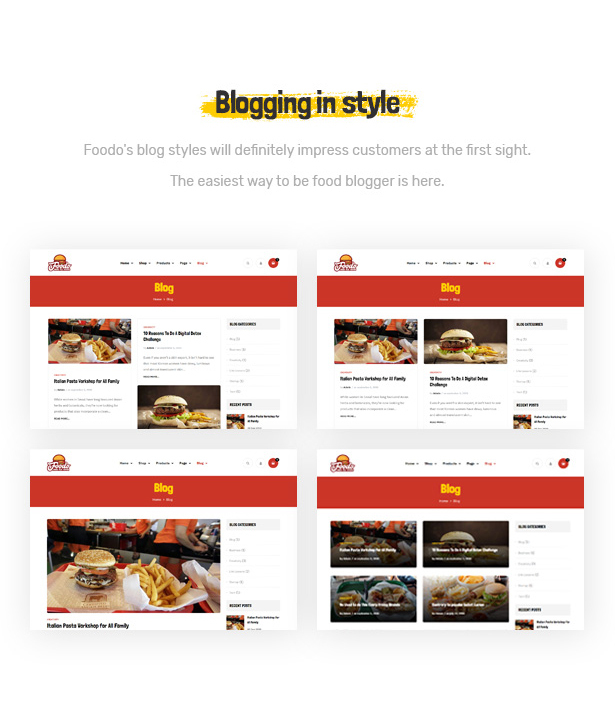 The layouts will satisfy your demands to sell any types of fast foods with effortless and time-saving. 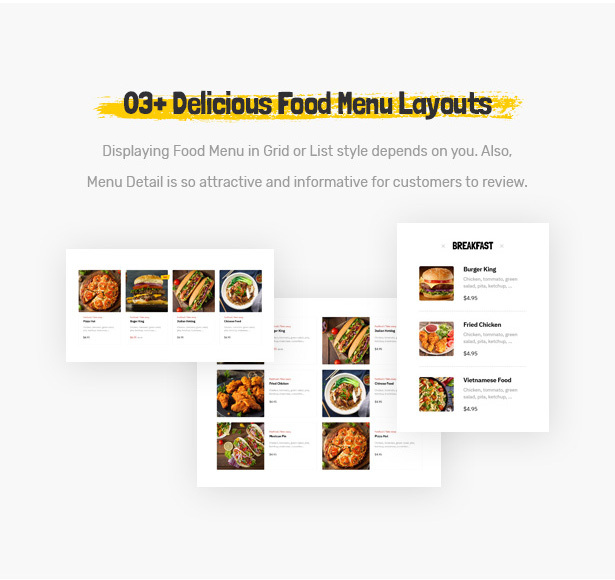 Food Menu shown in Grid & List style surely increases customers satisfaction to your store. 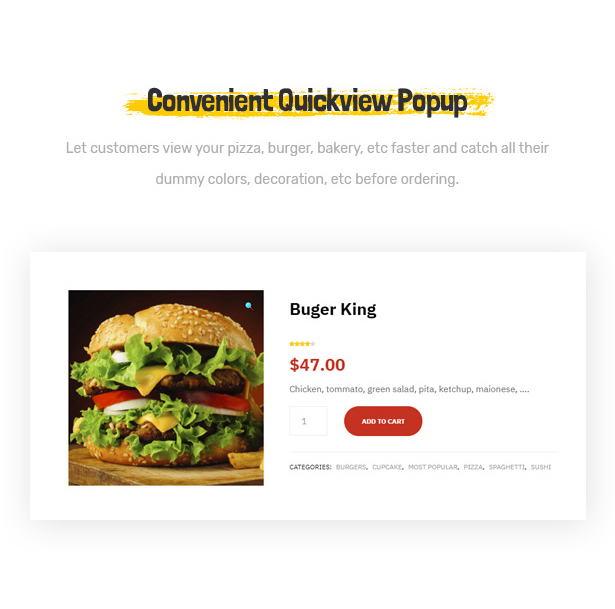 They can have a product quickview enclosed essential information such as price, description. Sharing attractive & delicious food stories all over the world to your consumers is an ideal way to stimulate their appetite. Blog designed exclusively will make you and clients fall in love immediately. 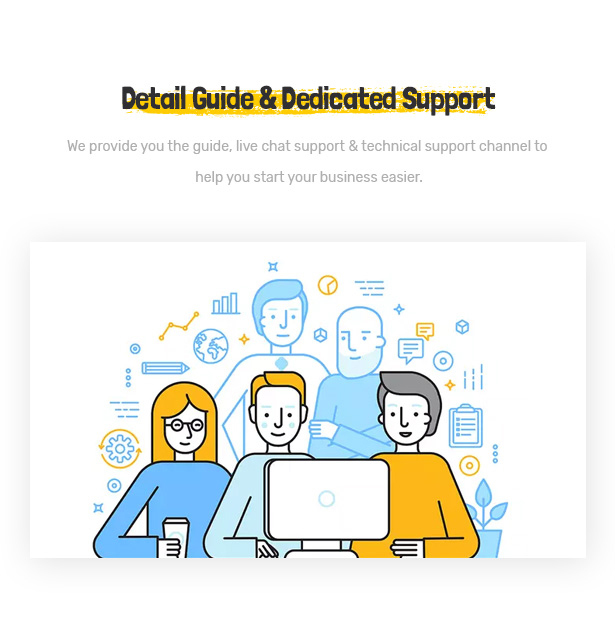 Foodo empowers your store with so much more inner pages: About us, FAQs, 404, etc. 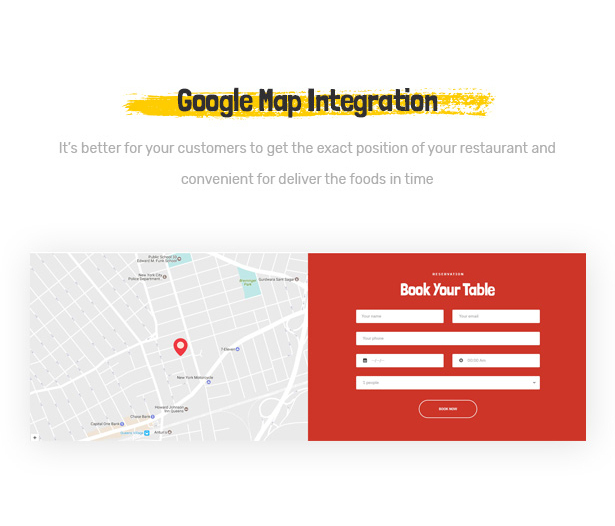 The pages will dramatically boost customer’s trust to your restaurant when they know address, contact info and responds for their suspicion. A quick view to show item details following with dummy colors, decoration before coming to the page checkout. Shopping time-saving is important to keep customers back your store. 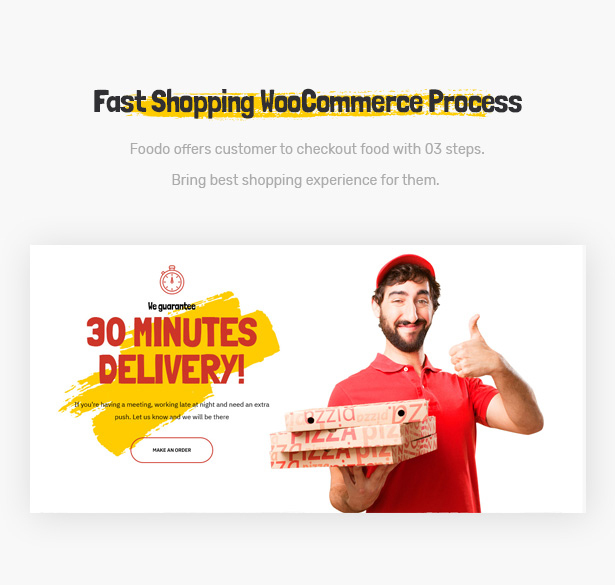 Foodo comes with WooCommerce will be powerful tool to boost shoppers to checkout in 3 steps only that brings them the best shopping experience. It’s convenient for consumers to get the exact address of your store on map that they can choose the nearst one if you have many in other places. This way helps to deliver the foods in a short time. 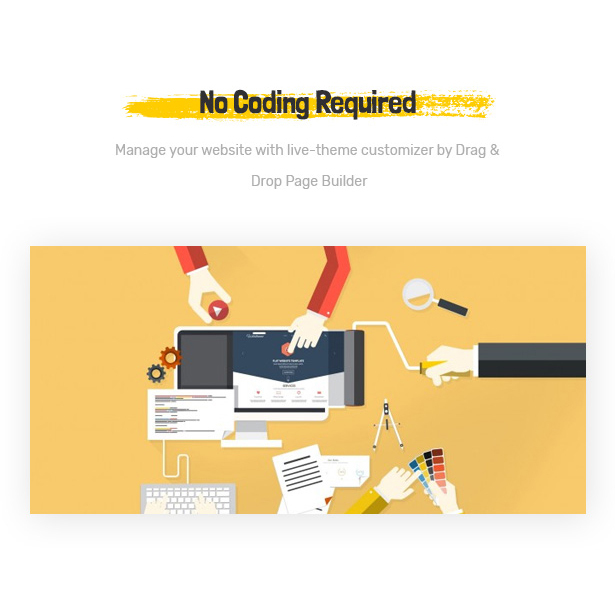 Less time-consuming customizer, you don’t need to get a code to customize the theme, boxes, content, etc all of theme is performed on the frontend via Drag & Drop Page Builder. A magic tool helps to set up the website in some seconds that helps you save time to build a powerful website with beautiful demos insight. With a mobile focus, you can rest assured that every pixel will respond as it should no matter if your visitors are on a desktop, tablet or phone. 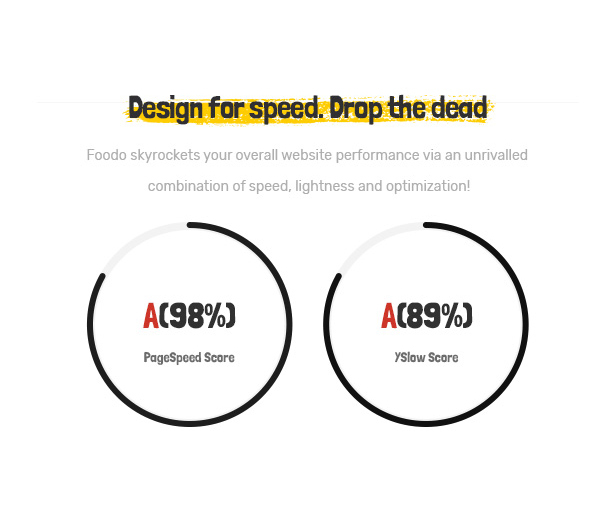 No need to worry about the site speed, Foodo WordPress Theme optimizes your website performance with lightness to create customers comfort when surfing your site. 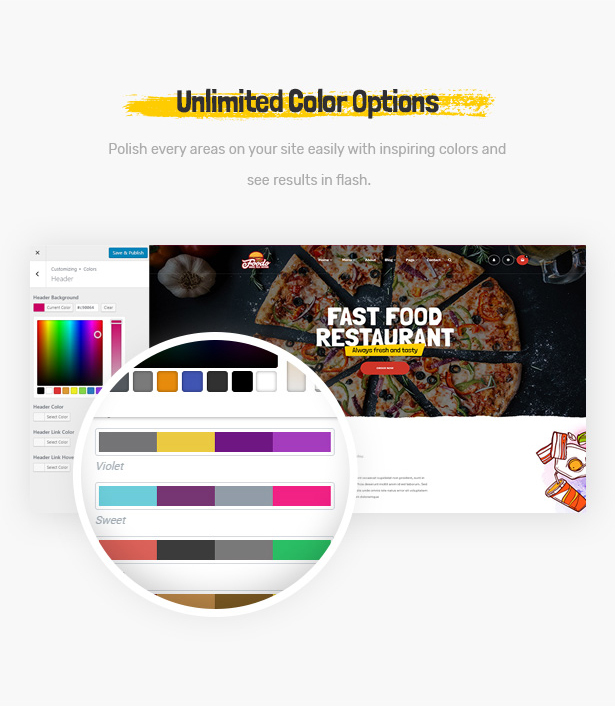 Make your store colorful with unlimited color options including heading, body, background, typography, and so on. Just some clicks will turn your site into a beautiful place to attract consumers’ attention. 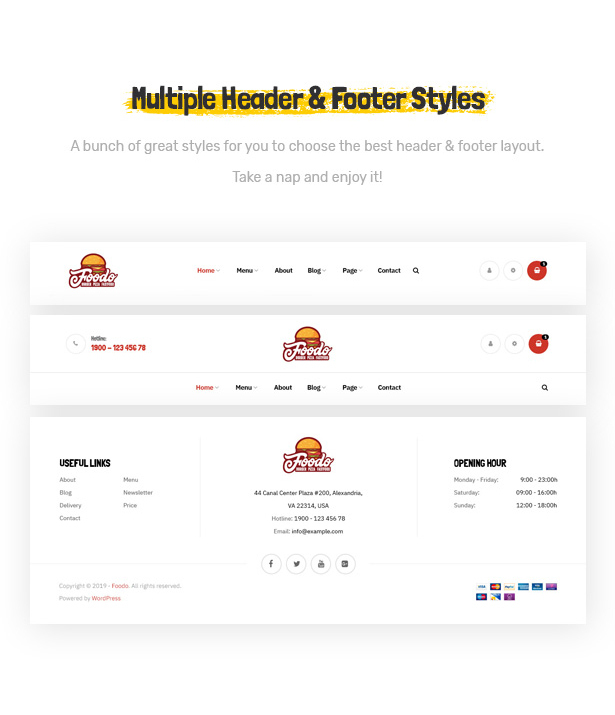 Coming with various stunning header & footer styles will not make you disappointed to pick the best one which is suitable with you demands. Let’s take a look how beautiful it is. 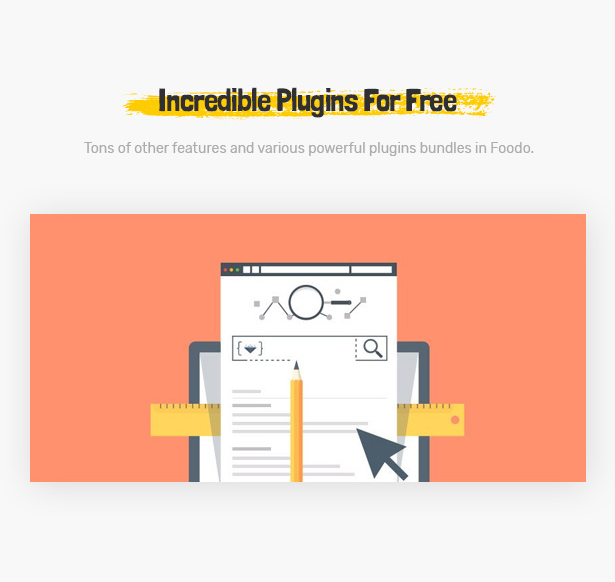 Foodo is able to integrate with a number of plugins following with tons of outstanding features that helps you empower your store in management. 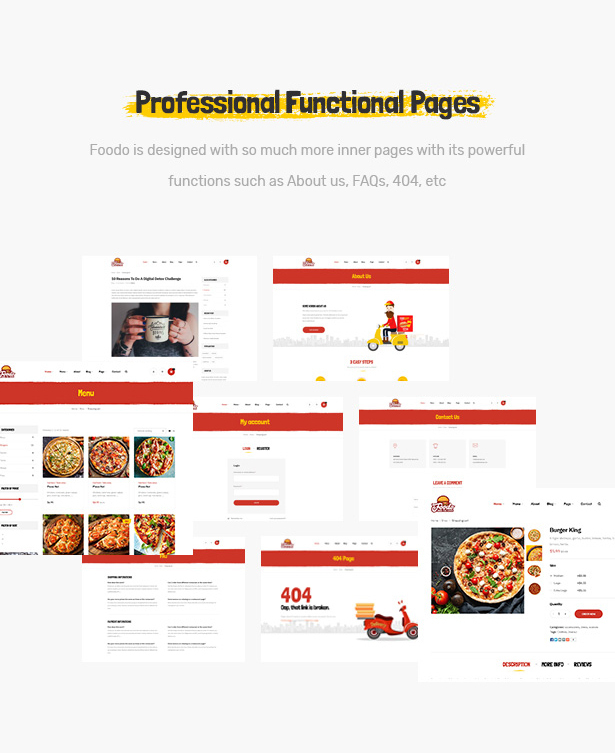 After purchasing the theme, we will provide you a detail guide as well as an enthusiam & professional support team to deal with your problems related to Foodo. WordPress Customizer Supported: allow you configuring theme’s functions via Wordpress options.